I’ve always had a soft spot in my heart for Marvel’s ‘Batman’. One of the first books I read regularly. At one time I had everything he’d been in from ‘Werewolf by Night’ to the ‘Hulk’ magazines and up through his second title. Who doesn’t love an Egyptian God’s schitzo-billionaire agent of vengeance. In fact, I think ‘Agent of Vengeance’ is about the only title they haven’t tried to slap on one of Moonie’s books. After they shoe-horned him into the West Coast Avengers, I kind of lost interest. The big selling point for me was Bill Sienkiewicz’s art and Doug Moench’s writing. After that, he sort of morphed (or maybe devolved) into a rich ‘lunatic’, which is more Batman’s forte. Stephen Platt’s interpretation was kind of interesting in a marshmallow-steroidal sort of way (even the veins in his arms had muscles). I did jump aboard the Charlie Huston/David Finch train, but jumped off after they left and the art went to hell. I won’t even get into ‘Body Armor Moon Knight’. Looked like they modeled him after one of the many Batman action figure variants out there clogging the pegs. 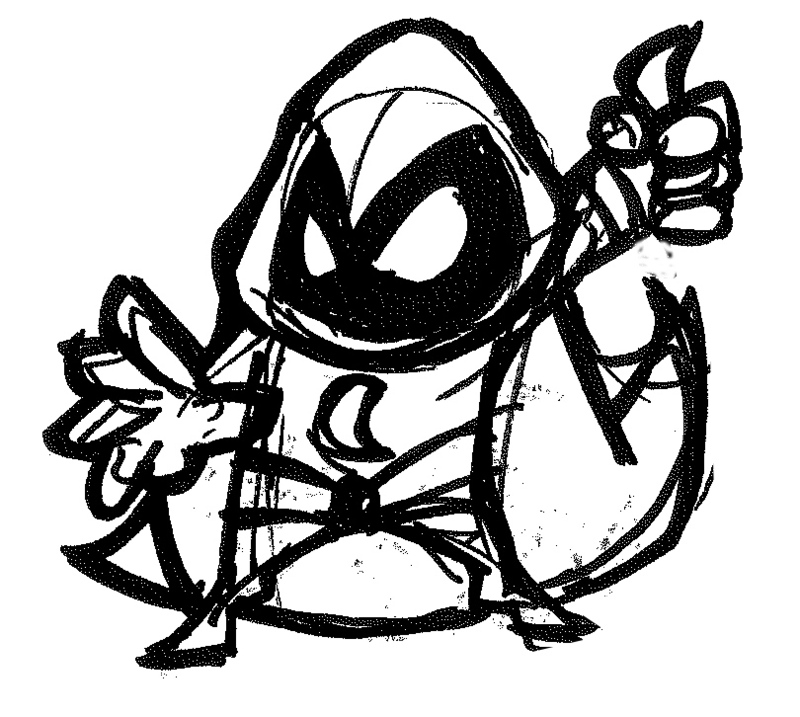 So…here we go, my interpretation of Sienkiewicz’s interpretation of the Moon Knight. Check it out over a cup o’ joe at Gina’s. Ah..and a return to the stumpy legged super-hero! I guess I could go all Liefeld and just draw him standing in smoke. I think we linked to the ’10 worst Liefeld’ images at one time. We should find that one again. I tried. The link we used is dead and I couldn’t find it anywhere else in my brief search.